Looking for a high-end holiday getaway in the ruggedly wonderful Canadian Rockies? Eager to experience Spring Creek up close to see if it’s the right fit for you and your family? Many owners of Rundle Cliffs Lodge apartment condos have taken advantage of their option to rent their homes out for short stay holidays through Spring Creek Vacations. Reflective of the quality and style throughout Spring Creek, these one, two, and three bedroom condos include large kitchens, stone fireplaces and oversized windows that fram the unforgettable mountain views Canmore is famous for. 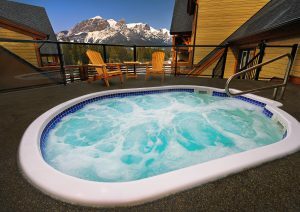 Relax in Rundle Cliff’s outdoor hot tub overlooking the rugged Rundle Range. Rundle Cliffs Lodge – one of the premier Canmore Vacation Rentals.